One of the most symbolic Jewish wedding traditions is the breaking of the wedding glasses. The custom represents the destruction of the Temple of Jerusalem and recognizes the new bride and groom as members of the spiritual nation of Judaism and its destiny. www.TraditionsJewishGifts.com offers a collection of Jewish wedding glass keepsakes that are striking gifts. Our Jewish Wedding Glass Keepsakes are great for storing the glass from the treasured tradition in a dazzling case that is rich in sentiment. 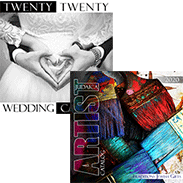 Not only are these Jewish wedding keepsakes practical, they are also picturesque. 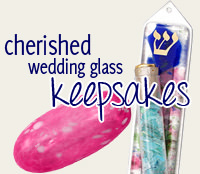 The most popular Jewish wedding keepsake is the wedding glass mezuzah. www.TraditionsJewishGifts.com offers a variety of wedding glass mezuzahs in a range of dynamic designs. Choose from the Heart Wedding Glass Mezuzah, Wedding Glass Mezuza, Entwined Rings Mezuza, Heart Wedding Mezuza, Wedding Glass Mezuzah with Stones, Woven Wedding Glass Mezuzah, Blue Vortex Wedding Mezuzah, Amber Vortex Wedding Mezuzah and more. The mezuzah isn't the only option for encasing precious crushed wedding glass. Jewish wedding glass keepsakes also include the Blown Glass Ball & Velvet Pouch, Wedding Glass & Embroidered Pouch, Crushed Wedding Glass Lucite Cube, Wedding Glass Cake Plate, Crushed Wedding Glass Menorah, Wedding Glass Candlesticks, Wedding Glass Dreidel, Broken Wedding Glass Menorah and other gifts. Any of these crushed wedding glass keepsakes are ideal for preserving wedding glass in a fashionable and functional manner. Our Jewish wedding keepsakes are designed to fit within any budget. Whether you are looking for an affordable wedding gift or a lavish token of adoration, www.TraditionsJewishGifts.com has special something in every price range. To get your Jewish wedding glass keepsakes, visit www.TraditionsJewishGifts.com.